I love to learn. And recently, I had the fantastic opportunity to participate in a 'How to be a Brain Friendly Trainer' programme run by Stellar Learning. Those of you who know me well will know that 'brain friendly learning' has been a passion of mine for several years now. It involves using what we know about how the brain learns best, to find the best ways to design and facilitate learning as well as improve communication and engage people. So the opportunity to learn from Stella Collins, recognised author of 'Neuroscience for Learning and Development', was too good an opportunity for me to miss! The three days in Berkshire were a true inspiration filled with hats, building blocks, light-bulbs, bridges, chocolate, pillows and so much more. After my time there, I feel that I have come away having really stocked up my brain-friendly learning tool box! I now have an even broader and more creative range of tools and techniques to help learners get the most from each and every programme I run. I am itching to get started! 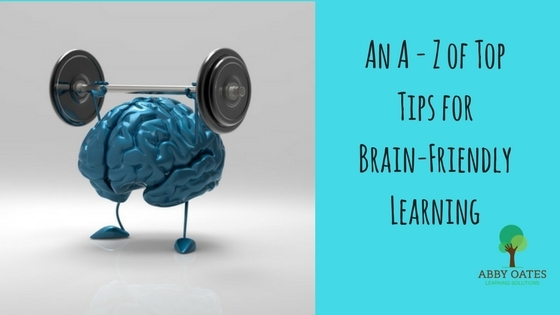 Well, as part of my personal post-course review of my learning from this programme, I challenged myself to come up with an A-Z of Top Tips for making my training more brain friendly. After creating these Top Tips for myself, I wanted to share them with you too. So that together we can spread the word about the power of brain friendly learning, and go on to save the world from dull, meaningless training... forever! So I plan to share this A-Z with you as a series of blog posts - look out for them over the coming weeks. And keep an eye out for my first top tip for making your learning more brain-friendly, "A is for..." It will be coming to you soon!